It’s easy to see how this idea of overwintering tender plants indoors can quickly get out of hand. 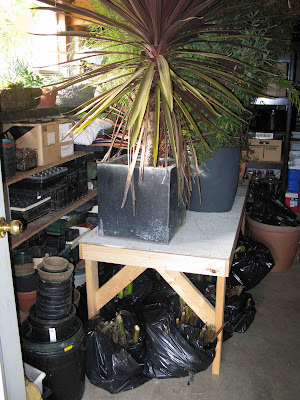 It’s easy to see how this idea of overwintering tender plants indoors can quickly get out of hand. The first year it was one bamboo and two cannas. Now those original plants have multiplied and I’ve also become attached to a few other tender beauties. Last week we had a couple nights in the mid-20s and it was definitely time to make the big transition into the basement. 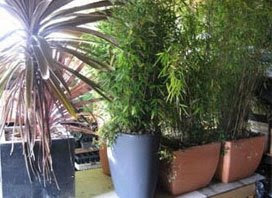 The list of those headed indoors had expanded to include six bamboos, one cordyline, 20 cannas, eight dahlias, 12 pots of tender succulents and a friend’s mandevilla. If we wanted to still be able to use the rowing machine (you never know when the physical fitness urge might hit! ), it was clear that we needed to use our space more efficiently. The photo at right shows the solution. My ever-willing and ingenious partner built this sturdy table out of scrap wood. I specified 28” high so the potted plants would have enough headroom to clear the ceiling. 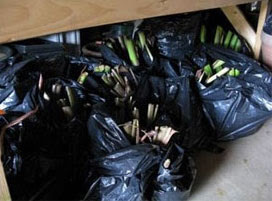 Below, there’s plenty of room for the cannas and dahlias, which are in black plastic bags on the concrete floor. The plastic shelf in front of the window came from an old greenhouse. It’s suspended by six heavy-duty wires attached to screw eyes in the rafters. The pots and troughs of echeverias, agaves and sedums are on watertight trays to make watering easier. 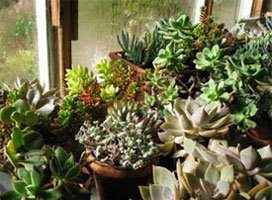 From now until spring, I’ll need to water the succulents and potted plants about once a month. The idea is to keep the soil barely moist, and because the temperature in the basement stays down around 50 degrees, they don’t require much water. The cannas and dahlias will get checked twice during the winter to ensure the tubers are not drying out too much. A misting of water is all they might need. More importantly, I’ll be watching to make sure they’re not too moist, because rotting is usually more of a problem than drying out. The plastic bags encircle the stems loosely, so by opening the bags more or gathering them more tightly, it’s pretty easy to control moisture loss. I still have to make room for a phormium, a dwarf chamaecyparis and a libertia, which I am keeping on the front porch for a couple more weeks. That’s it though. No more. Really. For more on this topic, read the post Easy Overwintering. Wow, I know what you mean about the tender plants multiplying over time. Your pot of succulents looks exactly like my collection. Wow. You are lucky to have a basement area which is cool with so much light!! My plants kind of wither until March until I repot and bring them into cool (60 degree) temps. Thanks so much for the ideas! !